Radio Interview: Does Hot or Cold Water Freeze Faster? Robyn Williams: You’re about to hear sacrilege, something that sounds like voodoo physics, but is from a highly respectable source. Len Fisher is at the University of Bristol in England, which has a student demand exceeding that of Oxford and Cambridge I think, and he was once with CSIRO. His latest book is called How To Dunk a Donut – The Science of Everyday Life, and though it’s got a racy title, he swears by the authority of the contents. Len is a respectable research scientist. So why is he proposing something that seems straight out of the Flat Earth Society’s advisory sheet? Here’s Len and a tale about freezing winters, something large parts of Australia can associate with this week on these cold mornings. And yes, you can try this at home. 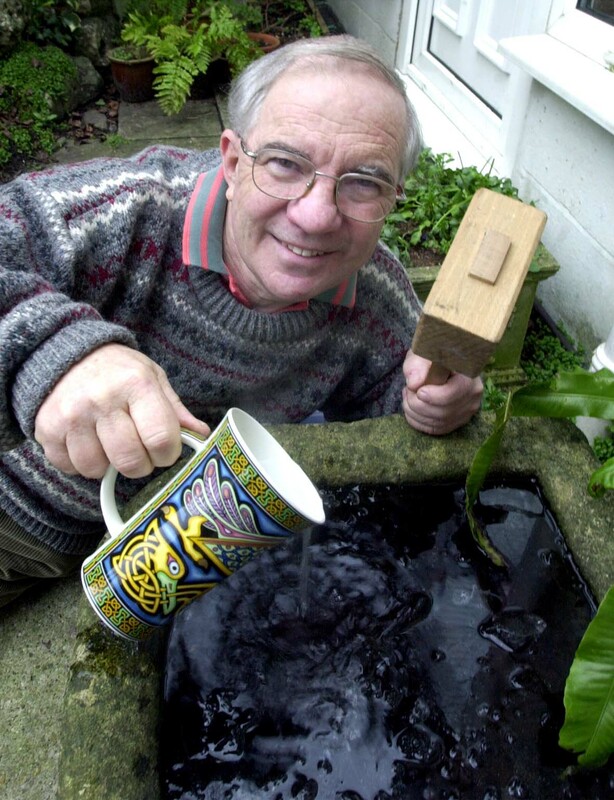 Len Fisher: Earlier this year, England experienced a prolonged cold snap, and the Royal Society for the Protection of Birds advised people to fill their bird baths with hot water so that they wouldn’t freeze over too quickly. It sounds like perfectly sensible advice, but one member sent in an email saying that the advice was wrong, and that he was sure that he had read somewhere that hot water freezes faster than cold water. The first that I knew about it was when I received a call from BBC Radio 4’s ‘Today’ program, asking whether I had heard about it, whether it was true, and could I demonstrate it the following morning? As it happened, I did know something about it. When I joined the CSIRO Division of Food Research in 1969, news of this effect was in the scientific headlines. My colleagues and I performed quite a few experiments to try to work out what was going on. We had a lot of fun with these experiments, but we were not allowed to publish the results because the topic was deemed by the CSIRO hierarchy not to be sufficiently serious-minded. Thirty years and hundreds of publications later, physicists are still trying to work out why hot water sometimes freezes faster than cold water. I was happy to talk about the effect and to try to demonstrate it even, because it seemed an ideal opportunity to show a wider public how science really works, which is something I now spend a lot of my time doing. Some scientists do this to persuade more children to take up science, or to educate the public to make informed judgements on scientific issues, or especially to persuade politicians to provide more money for science. I am sure that these are all worthy reasons, but they are not mine. My own reason is much simpler, and one that is common to most writers: I love what I do and I want to share it. One way that I share it is to demonstrate how science applies to the everyday activities of life. This is how I came to be out in my garden at 6 o’clock on the coldest morning in the English January, demonstrating to a shivering BBC presenter and his invisible radio audience that the hot water in one of my wife’s plastic mixing bowls froze faster than cold water in an identical bowl. The presenter was visibly astonished when the experiment worked, though not as astonished as I was, since I knew from my earlier experiments that the effect only happens under certain conditions, and I could only hope that I had got the conditions right. The audience response was so great that I was asked to go back on the program the next day to explain the effect in more detail. The size of the response reinforced my belief that there is a widespread public fascination with accessible science, and that scientists and non-scientists alike are intrigued by experiments that seem to show the world operating in a counter-intuitive way. Sharing the scientific interpretation of such experiments is difficult though. Despite the fact that mankind’s view of the world and our place in it are now dominated by the discoveries and insights of science, few people outside science are aware of what those discoveries are, let alone how scientists go about uncovering them or how they bear on our everyday lives. Scientists are usually seen as being separate from everyday life, and the rules that they have discovered are often seen as being beyond the comprehension of ordinary mortals. It doesn’t have to be like that. My own view is that science belongs with literature, art, philosophy and religion as an integral part of our culture. Science is a way of seeing the world, but it is not the only way. What makes science different is that its pictures can be checked out against reality. That reality is all around us, and scientists have frequently made important discoveries through observing everyday phenomena. The Anglo-American Count Rumford, for example, discovered the principle of heat convection after burning his mouth on a hot apple pie. Modern-day physicists are now using this principle to try to explain why hot water can sometimes freeze faster than cold water. The effect was known as far back as Aristotle, but it is now called the ‘Mpemba effect’ in honour of the Tanzanian schoolboy who rediscovered it in 1969. When I described it on the BBC’s ‘Today’ program, I was bombarded with indignant letters telling me that the writer’s grandmother had known all about it, or that Sir Francis Bacon had written about it, or even that the writer had personally discovered it for him or herself. It was little Mpemba though who persuaded modern-day scientists to take it seriously. Mpemba discovered the effect that is now named after him when he was making ice-cream for a school project. The class had been told to let the warm mixture cool before putting it in the freezer, but Mpemba was in a hurry and he put his mixture in the freezer while it was still hot. He found to his astonishment that it froze faster than those that had been allowed to cool before the children put them in, but when he asked his teacher why this was, he was just met with disbelief. What makes Mpemba special is that he stuck to his guns in the face of laughter from his teacher and schoolmates, and kept experimenting until he was able to find conditions which were similar to the ones that I used in my garden, where the effect always occurs. It is to his teacher’s great credit that he was eventually convinced, and was even able to convince a visiting physicist that Mpemba’s effect was not just the result of some one-off circumstance. Mpemba’s example shows that real science need not be the prerogative of the specialist, but can be accessible to anyone. It would be silly to pretend that all of science is accessible in this way, not because you need to be particularly clever to understand some of the more abstruse reaches of science, or even because like any expert tradesman, you need to have mastered the tools, such as mathematics, needed to do certain jobs. Both of these are true, but there is a more fundamental problem which is that Nature does not always obey commonsense. This lies at the heart of the scientist’s difficulty in sharing science with non-scientists. The history of science is largely a history of attempting to understand the world in commonsense terms, and of repeated failure. Scientists have only been able to make progress by accepting a series of non-commonsense beliefs that have become ever more outrageous as we probe deeper into Nature. Even the oldest and simplest of these still causes trouble. Some 30% of otherwise well-educated people still hold to Aristotle’s 2000-year-old commonsense view for example, that objects only move if they are pushed or pulled. They haven’t caught up with Newton’s less intuitive, but more correct picture that objects either stay still or move in a straight line at constant speed unless they are pushed or pulled. Newton’s insight is 400 years old, but I have still won free pints of beer from people who were willing to back Aristotle. I did it by riding my bicycle past our village pub, throwing a stone straight up in the air as I passed the door, and challenging my fellow drinkers to predict where the stone would land. Think about it for yourselves for a second. About one in three of my drinking companions predicted that the stone would stop moving forward when it was released, and would thus land behind me, just as Aristotle said it would. The rest predicted that it would follow Newton’s Laws and land beside me. Unfortunately my throw was perfectly vertical, and the stone actually came down on my head. Scientists experience other forms of pain as well. It takes years of training, and sometimes a fair bit of mental pain, for a professional scientist to accept the many counter-intuitive beliefs that Nature has forced on us, and to learn to use these beliefs to solve problems. Little wonder that people outside science can’t always understand what we are doing or why we are doing it. What we are doing is either testing our beliefs or applying them to try to understand how Nature operates. It is a very human activity, but explaining and sharing it is bedevilled by the counter-intuitive nature of some of the beliefs and their consequences. My approach is to show how the picture of Nature that science has developed applies to the experiences of everyday life. By doing this, I am to make science available through things that people already understand and to remove the fear of science that many people feel. In the case of Mpemba’s ice-cream, one possible picture is that some of the hotter water evaporates so that if we start with equal quantities of hot and cold water, by the time we reach the freezing point there will be less of the initially hot water left to turn to ice. That picture certainly applies in some cases, but it is a very small effect. More usually, the initially hotter water develops circulating convection currents which being its hottest parts to the surface to cool off. The reason why Count Rumford burned his mouth on a hot apple pie was because such convection currents were prevented from forming by the mass of apple fibres, so that the centre of the pie remained hot. It is worth noting that nobody before Rumford recognised the role of convection currents in transferring heat. In the mid-19th century the received wisdom was that since water is an insulating material, heat should travel across it very slowly. It took the genius of Rumford to realise that the water could actually move and carry the heat with it, unless the movement was blocked. He tested this hypothesis by stuffing an eiderdown in a pot of water, which he then heated from below. He found that the water at the top remained cold even when the water at the bottom had started to boil. The idea of convective heat transfer is now a commonplace, but it is worth remembering that there was a time when it was not obvious from commonsense. Until more people outside science understand our hard-won belief system though, scientists are stuck with using commonsense to try to explain what we are doing. The abiding problem is to do this but still to show that our often counter-intuitive beliefs are needed to provide the full picture. It is almost impossible to do this on television with its ‘sound-bite’ culture, but I have found that radio interviewers especially, are often interested in getting below the surface simplifications that are an essential first step in describing science to non-scientists. With their help I have used biscuit dunking, gravy absorption by roast dinners, and even the art of making love in a spaceship to show scientists go about their business and how they see the world. My approach occasionally backfires when it is picked up by journalists and treated as ‘news’. Even then, the journalists concerned have usually taken great care to get the actual science right and their stories have often produced letters from schoolchildren wanting to know more. The stories have also stimulated the interest of publishers, and so I have been able to put the real stories of scientists and how they go about their business in book form, which provides a solid foundation for whatever I want to say. One amusing side-effect of some of the publicity has been the award of the spoof ‘IgNobel Prize’ at Harvard University for my project on biscuit dunking. These prizes were originally invented to show up and discredit pseudo-science, but they have increasingly been awarded to projects that ‘spark public interest in science’. Their motto is now, ‘First, they make you laugh, then they make you think’. That has certainly been my motto in my attempts to make science a part of our everyday awareness, rather than something that is separate and the province of experts working away in laboratories. By showing the same principles apply to the world outside the laboratory, I aim to share the beliefs and the sense of fascination and reward that scientists are privileged to feel every day as part of a normal occupation. Robyn Williams: Scientists having fun; and so can you. Read about it in Len Fisher’s book ‘How To Dunk a Donut, The Science of Everyday Life‘, published by Weidenfeld & Nicholson. He’s ex-CSIRO, now at Bristol University. His theme is taken up next week by another CSIRO communicator, Julian Cribb, on why we spend lots of money on science but so little on telling folk about what it does. Thanks are due to Robyn Williams and the ABC for permission to reproduce the full script of this talk.